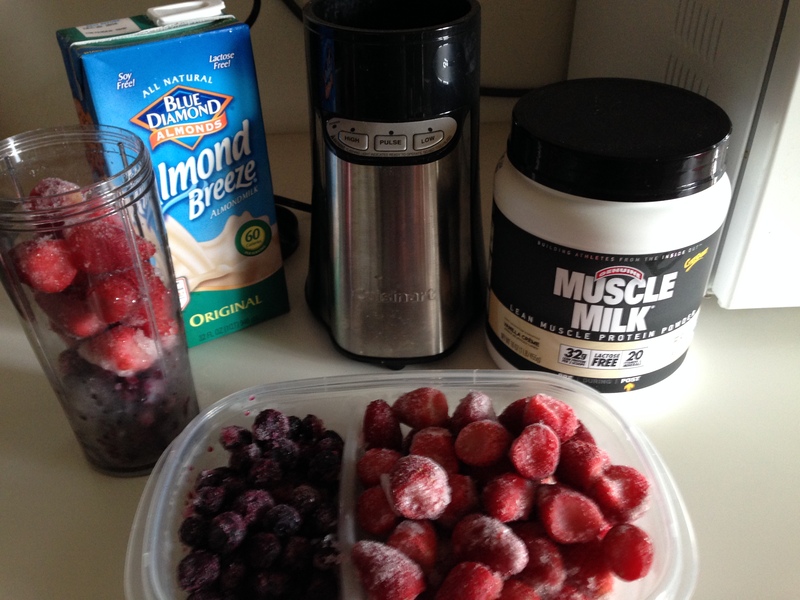 Something quick and easy for after a workout! Blend fruit and milk. Add protein powder and more milk and blend again. Boom! 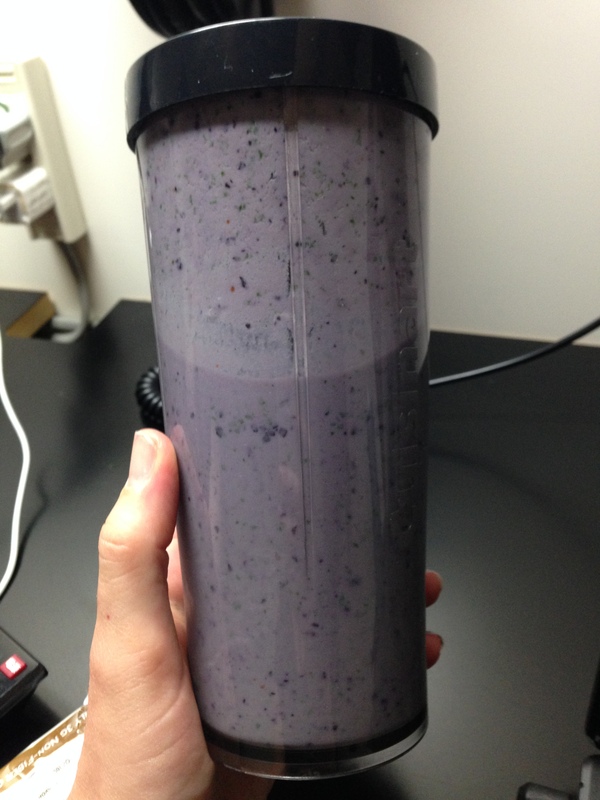 If I made this smoothie again, I would thaw out the fruit beforehand so the texture isn’t quite so thick when blended. I ended up adding more milk to balance it out. I added the protein last because I expected it to cause extra thickness but the frozen fruit presented the same problem. The protein powder I used (shown above) is very, very sweet. I used 2 scoops for extra protein, but the result was double sweetness. It was like a tasty dessert at first but the flavor was too much after a while. This smoothie was also extremely filling. I pride myself in being able to put away a disgusting, shameful amount of food, and I could barely finish this. Overall, I like the simplicity of this smoothie. It’s perfect as a quick post-workout meal. 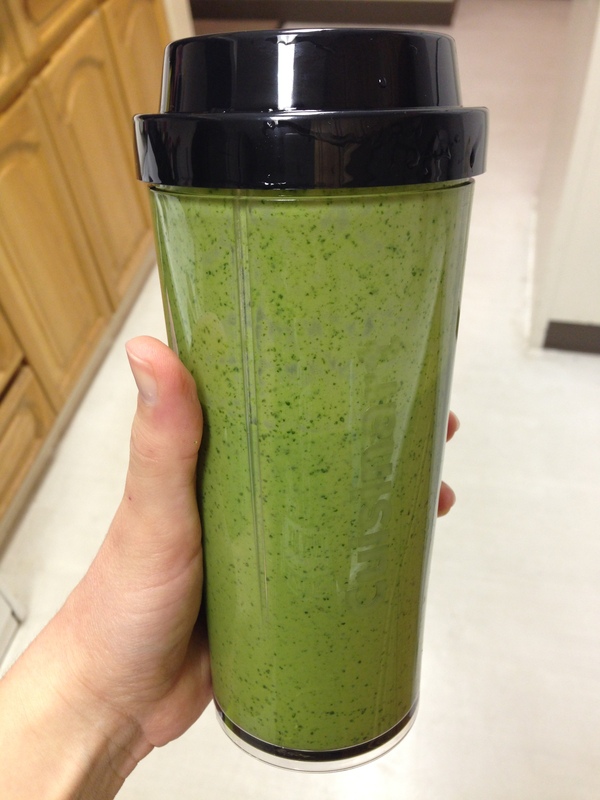 I was rushed today when I tried making this smoothie so I ended up following the recipe pretty closely, for once. Put blueberries into cup extremely carefully because they stain everything and you don’t want to ruin your shirt. Wash hands immediately. Put in kale, maybe? And then pineapple? Oh, the can has juice. It’s close enough to a half a cup. Guess you don’t need water! Add yogurt and as much peanut butter as possible because you do what you want. Your BEST! friend insists on tasting it first. “It tastes like plants,” he assesses. Taste. Something is missing. Try it again. It’s all right. Hours later, your friend reads blog over shoulder and insists on being called “best friend.” Edit post. 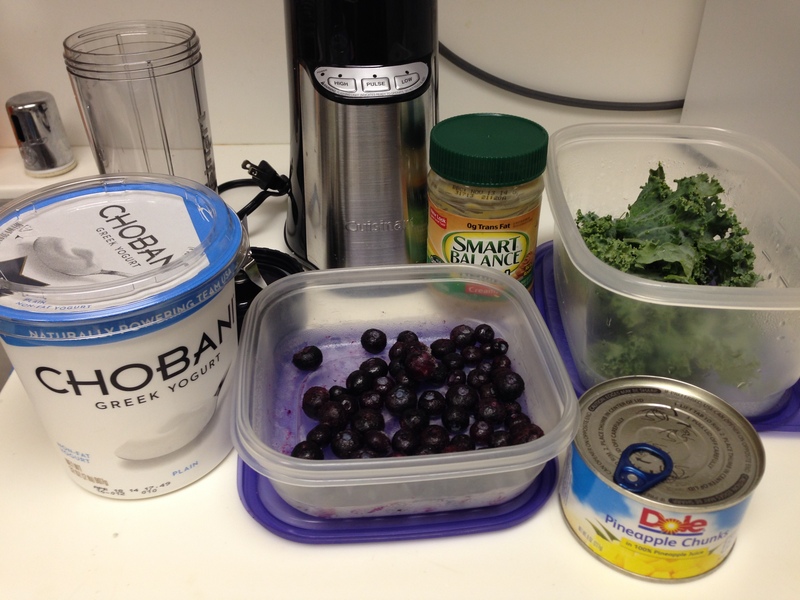 Filling and yummy – can’t taste the kale – but I can’t help but feel like something is missing in terms of taste. I still can’t put my finger on it. I’ll try making this again in the future and I’ll do it a little differently. In the meantime, if you have any suggestions on things to add, subtract, or modify, please let me know! UPDATE 27APR14: Thanks for all the suggestions! I made this again recently with frozen banana. I liked it a lot better that way. But there’s still an underlying acidity in the aftertaste – not sure if it’s the pineapple or the blueberries. Next time I make it, I’m going to try leaving out the pineapple and see if the acidity is still there. I don’t have enough veggies in my diet and have to trick myself into eating them. Smoothies are tasty and filling. I’m too lazy to cook actual meals like a grown-up. I get inspiration from recipes I find online, but I can barely even follow simple instructions with basic measurements. I don’t know what’s wrong with me. So my smoothie-making process looks something like this: scour Pintrest for recipes, buy those ingredients, throw them all together in the blender, and hope for the best. This is why I’m terrible at cooking and baking. Here is the first of what I hope will be a series of hilarious blender trial-and-errors. Peel banana. Desperately want to eat it by itself. Exercise willpower. Sadly break banana apart with hands and drop it into blender. Throw in the yogurt, peanut butter, and almond milk after it. Stuff in as much spinach and kale on top as you can, breaking the leaves apart if need be. Add cinnamon. Make sure there is room for the blender blades. I didn’t consider that beforehand. Have a sip. Tastes pretty good, mostly like banana. Notice the cup is only maybe two-thirds full. Stuff some more spinach and kale in there. Blend. Taste. Little thicker and tastes less like banana. Cup still has some space. More spinach and kale! And almond milk so it’s not so thick. Blend. Taste. Okay, that’s enough greens. Enjoy. Like I said before, this tastes mostly like banana with hints of peanut butter and cinnamon, despite it being super green. It’s a sneaky way to eat more veggies, and spinach and kale are very good for you. The sneakiest part is that you’re eating a lot more greens than you would if they were just on a plate in front of you because they take up so much less space once they’re chopped up in the blender. It’s like a concentrated shot of healthiness, one that you can’t even taste. This makes me feel like I’m hacking at life. I’ve made this three times now and I’ve found that the most important ingredient is the banana. 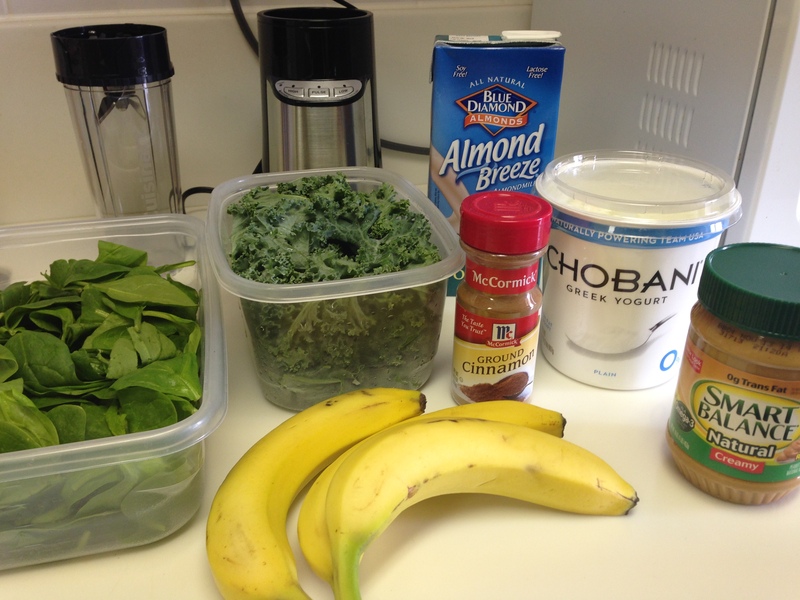 As long as the banana:greens ratio is right, it’s going to taste great. This smoothie is filling, tasty (despite it having kale, which is not even close to tasty), and has a huge margin of error, all of which is ideal for someone like me. And, all in all, I think it’s under 400 calories. It’s hard for me to say because I freestyle with the ingredients so much. 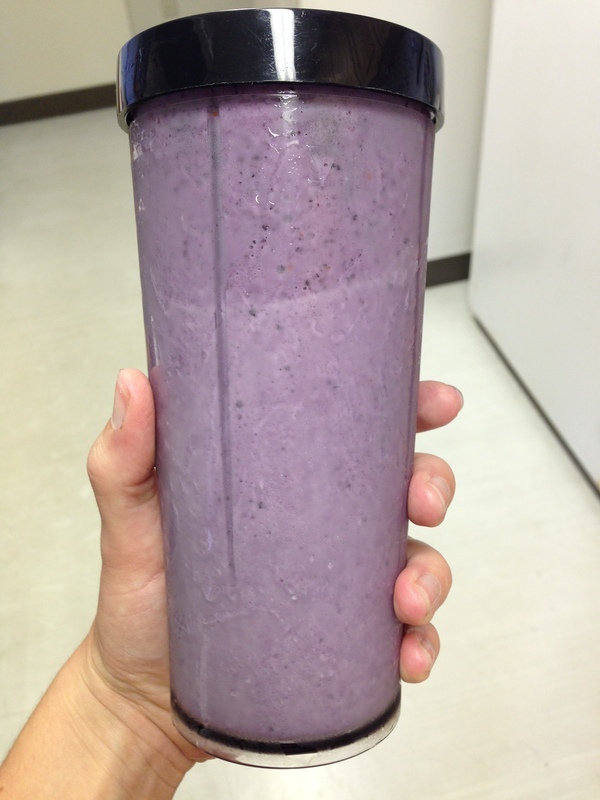 Even so, 400 calories is not a lot for a meal, and this smoothie definitely fills you up like a meal. I’ve had it for both lunch and dinner. Not bad for my first try! If you try it, too, let me know what you think – especially if it’s your first experience with kale!